The HP Velotechnik Gekko fx is the newest trike in the HP line-up. Its small, all new, and very fun to ride. 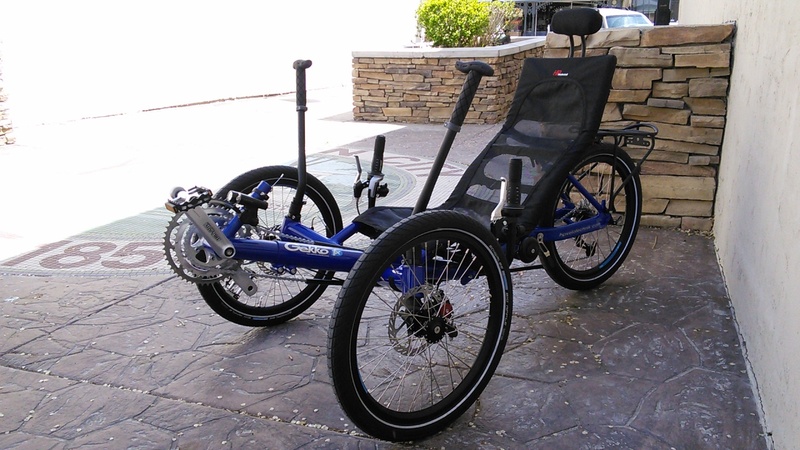 Sporting a completely rigid frame, this trike rides very different from its big brothers. 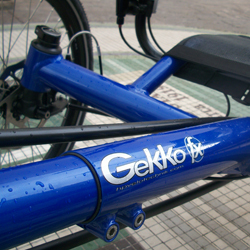 The Gekko rides very smooth for a non-suspended twenty-inch trike. Riding around on rough country roads did not shake me to pieces like other trikes tend to do. Due to the frame being aluminum, the overall feel of the ride is nice and stiff. It also gives you the advantage of keeping the front wheels on the ground when cornering sharply, because there isn�t as much flex as a steel frame. 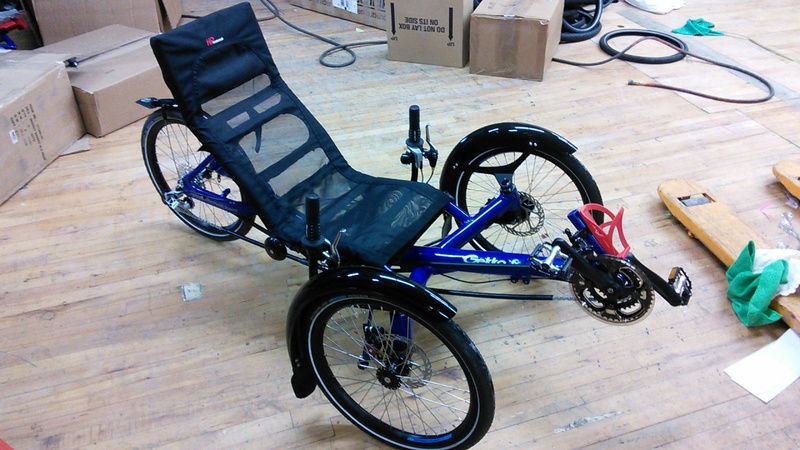 This trike weighs in at a nice 36 pounds, which for a folding trike isn�t bad at all. Cruising through the country side on the mid-level folding Gekko was super comfortable. The seat has about four inches of adjustment for recline which seems to be okay for me. I tend to prefer a more aggressive laid back seat angle, however for touring and pleasure riding, the seat angle is nice, and gives a good field of view. The mesh material and width of the seat frame make the seat feel very comfortable, and the mesh breaths very well. 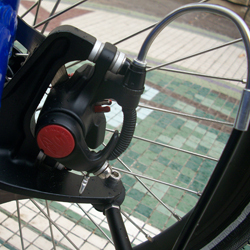 The boom is adjustable which allows adjustment for different rider heights. All the HP trikes are folding, and this one is no different. The Gekko folds right under the seat. However rather than pulling the seat off to fold the trike, the seat flips forward, and the rear wheel swings underneath the trike. The lower section of the seat is integrated into the frame, and the upper section is hinged at the base. This is a great feature because you don�t have separate pieces to keep track of. You only need to worry about carrying one piece on this trike rather than two or three. 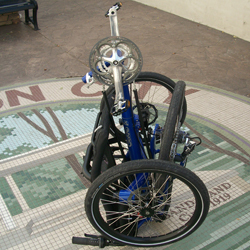 Rather than folding over the top like most folding trikes, the rear end of the Gekko flips under. This is what makes it possible for the seat to remain on the trike when folded. 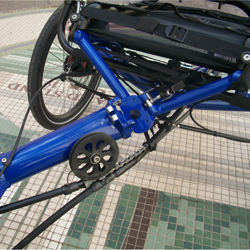 Both the seat and main frame have locking mechanisms to keep the trike from opening itself during transportation. The seat uses a velcro strap, and the frame uses a semi-flexible metal piece that locks over a bolt on the frame. The folding process is quick, easy, and painless. Our video review demonstrates the process in detail, and real time. Total folding time is approximately 45 seconds. Re-assembly is about the same. The dimensions when folded are: 37L X 32W X 28H. This is with the wheels on and the boom in place. If you were to remove the boom, wheels, and turn the handle bars down you can get the dimensions down to: 29L x 27W X 21H. The thing that impressed me about this trike was how clean and simple everything is. There aren�t any odd things to get hung up on in operation and style. Its a simple, to the point, and solid trike. 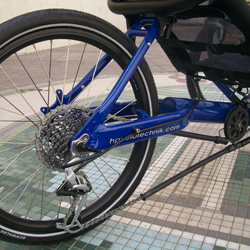 The components on this trike are much like the design of the frame: strong, simple, clean, and smooth. Being that it was a prototype, the components may change. The prototype model we tested was set up with the Sram X5 rear derailleur. For the price I haven�t found a stronger, smoother, or better looking derailleur. The front derailleur is a Shimano nine speed, nothing fancy. It operates well and takes care of business. 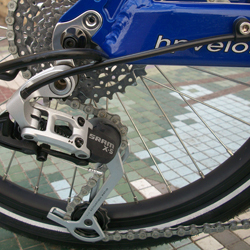 The front crank is the Truvativ Touro triple which works well and shifts smoothly. This drive train set up gives you a gear inch range of 17.5 to 84.9 which gives climbing ability and speeds up to 23 miles per hour, comfortably. The pedals are a decent quality platform, but if your going to be touring you may want to consider upgrading to clip-less pedals. The brakes are Avid BB5 mechanical disk which produce plenty of stopping power, and are fairly easy to adjust. HP gets the power and traction to the ground through a set of Schwalbe Marathon Racer tires. The Racers have a moderate puncture resistance, but you may want to swap those out for something with a little more tread and lower pressure, to improve the ride over long distances and reduce the possibility of flats. The steering on the HP Velotechnic Gekko is amazing. The Gekko uses an indirect steering system that provides a 14 foot turn circle. Not only is this system effective, but its intuitive too. It doesn�t do anything you don�t want, or expect. Priced very moderately, this trike is a fantastic addition to a collection, or a first time buy. 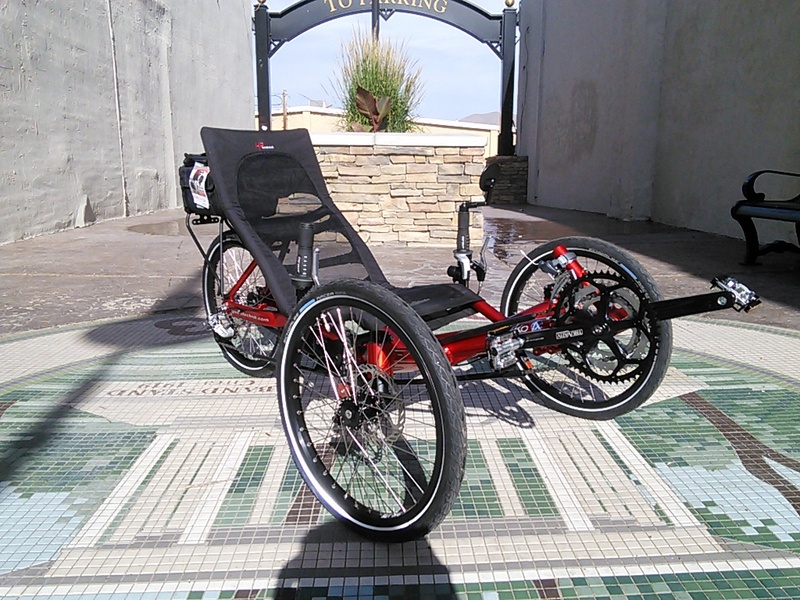 For the folding capability and component level you couldn�t ask for a better trike. This trike is very comfortable, functional, and simple. Whether your a seasoned rider or a first time buyer, the HP Velotechnik Gekko FX is great for anyone.